LRP ZR.32 Spec.2 Pull Start Nitro Engine « Big Squid RC – RC Car and Truck News, Reviews, Videos, and More! So we don’t give a lot of love to nitro around here as of late. Wrench still reps nitro like a champ, but the rest of us have pulled away for the most part. There is still a lot of nitro love out there though, and LRP has a new ZR.32 Spec.2 Pull Start Nitro Engine available for anyone looking for a little non-battery powered boost. XTEC T6 engine housing, XTEC PowerCarb 2 15S-2 carburetor with 9mm inserts, universal fit, and an ultra strong pull start all look to make this guy a winner. 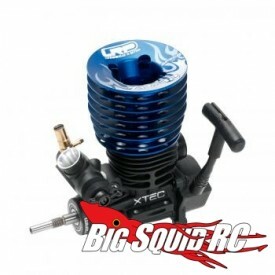 It’d fit great in your 1/8 scale buggy, truggy, or monster truck, and 4.34HP is no joke! It should be available now for around $330. Be sure to check out LRP for more info!